We're thrilled to have Janice Warman join us to share more about her novel THE WORLD BENEATH. Janice, what was your inspiration for writing THE WORLD BENEATH? 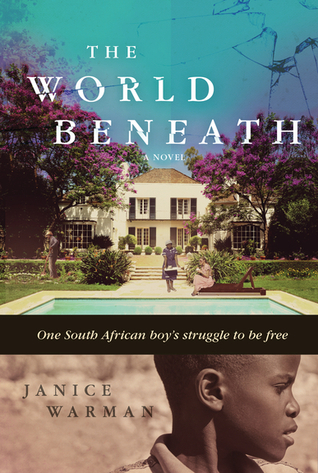 My inspiration for writing The World Beneath was twofold: First, to write a book that would inform and inspire children around the world about the evil system of apartheid – which happily is far in the past for them, but which like the Holocaust of the Second World War, should never be forgotten. I believe that like many classic children’s books (To Kill a Mockingbird by Harper Lee comes immediately to mind), books can be a far more powerful way to teach history than a dry textbook. And second, the inspiration for Joshua came from the daughter of our housekeeper, Beauty, whose name I used for the maid in the book. Although her little girl didn’t live with her, she visited for a few days and I remember as a small child myself trying to teach her to read. It made me think how much Beauty must miss her when she went home to the Transkei, where her grandparents looked after her and her siblings. I was shocked that white children were given free schoolbooks, but that black children had to pay for them. Beauty worked so hard to feed and clothe children she hardly saw, and to pay for their school uniforms. Then, in 1976, my last year at school, the Soweto riots broke out, and it was devastating to hear of all the children who were shot and killed. The house in the book is really my house (although luckily the Malherbes were not my parents!) and we too had a Basset Hound called Betsy. Take all the advice you can get. Share your writing. Do writing courses, join writers’ groups, carve out time for your writing, and give yourself a daily target (keep it low, so you will generally surpass it). Write everywhere - in coffee shops, on trains, planes and beaches. And never give up, no matter what life throws at you. I started out on a local paper in Sussex and then worked for national papers including The Guardian and The Observer, and had a previous non-fiction book published in 2007, so I wasn’t afraid of writing. But as John Lennon said, "Life is what happens when you are making other plans," and plenty of ‘life’ happened on the path to publication of The World Beneath. For financial reasons I had to work full-time and write The World Beneath and Class of 79, a non-fiction book about my fellow journalism students who fought apartheid, in my spare time - every evening, weekend, and holiday for four years, to meet the publishing deadlines. During that time I was extremely ill for six months. Most devastating, however, was the illness and death of my beloved mother, who lived far away in South Africa. My sister and I would fly out to see her at each crisis, and on the last occasion, she died an hour after I arrived. There is nothing to compare with the loss of a parent, and we both felt very guilty that we could not have been with her more in her hour of need. Then, in 2014, the year both books came out in the UK, I was diagnosed with breast cancer, although happily I am absolutely fine now. I would add that perhaps it might be wise to avoid accepting two publishing contracts at more or less the same time; however, that was just the way it happened for me! Following the cancer I have made a big change in my life - giving up a career in business publishing for a Creative Writing PhD at Goldsmiths College in London. For the degree, I am working on another young adult novel, The Tree House, about a young boy who realizes that across the valley from his eyrie in the yew tree outside his house, there is a girl being held captive in a hidden cottage in the woods. Little does he realize that soon he and Lea will be on the run in a race against time to solve a family secret - a vicious attack in France that tore her family apart two years before. Are her mother and baby brother dead or alive? Who can they trust? I am also writing a literary thriller, The Escapist, the story of two women whose husbands are wife abusers: rich, beautiful Helen, and slight, fair Sarah, who disappears. Was she murdered by Steve? Can Helen escape? And who killed Steve, found dead in the road outside the village? I am also planning another non-fiction book, Place of Hope, for which I will take a series of black-and-white portraits and record life stories in their own words of the inhabitants of a township in South Africa. The PhD is part-time so that I can work as a freelance journalist too. Having previously done a Creative Writing MA at the University of Sussex, where I wrote the first version of The World Beneath, I would recommend these degrees to aspiring writers. They provide the structure and discipline you need, plus the inspiration not only from your tutors but importantly, your fellow students. At the rise of South Africa’s anti-apartheid struggle, a boy must face life decisions that test what he believes—and call for no turning back. South Africa, 1976. Joshua lives with his mother in the maid’s room, in the backyard of their wealthy white employers’ house in the city by the sea. He doesn’t quite understand the events going on around him. But when he rescues a stranger and riots begin to sweep the country, Joshua has to face the world beneath—the world deep inside him—to make heartbreaking choices that will change his life forever. Genuine and quietly unflinching, this beautifully nuanced novel from a veteran journalist captures a child’s-eye view of the struggle that shaped a nation and riveted the world. Janice Warman is a South African–born journalist whose career spans the Observer, the Guardian, the Spectator, the Daily Mail, and the BBC. She has published two nonfiction books for adults, including The Class of ’79, about three students who risked their lives to help abolish apartheid. She lives in England. Have you had a chance to read THE WORLD BENEATH yet? Do your stories draw on events from your childhood? Do you write in various places? Share your thoughts about the interview in the comments!